Bloc countries and China—at that time was 1,315 ships with a total of 30.2 million dwt. The high point of the last dec- ade was reached in mid-1974 when 2,935 units of more than 233.8 million dwt were on order. 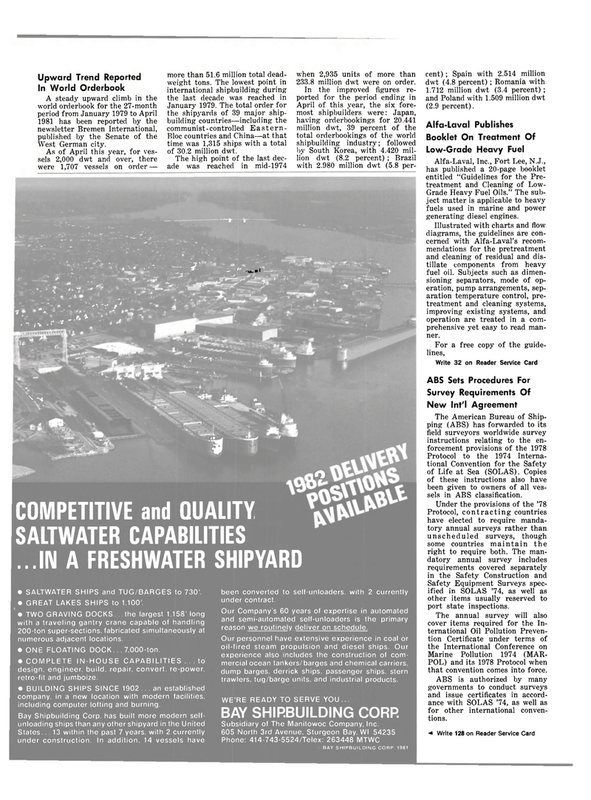 SALTWATER CAPABILITIES ...IN A FRESHWATER SHIPYARD 0 • SALTWATER SHIPS and TUG/BARGES to 730'. • GREAT LAKES SHIPS to 1.100'. • TWO GRAVING DOCKS.. the largest 1.158' long with a traveling gantry crane capable of handling 200-ton super-sections, fabricated simultaneously at numerous adjacent locations. • ONE FLOATING DOCK... 7.000-ton. • COMPLETE IN-HOUSE CAPABILITIES ... to design, engineer, build, repair, convert, re-power, retro-fit and jumboize. • BUILDING SHIPS SINCE 1902 ... an established company, in a new location with modern facilities, including computer lofting and burning. States... 13 within the past 7 years, with 2 currently under construction. In addition, 14 vessels have been converted to self-unloaders. with 2 currently under contract. Our Company's 60 years of expertise in automated and semi-automated self-unloaders is the primary reason we routinely deliver on schedule. Our personnel have extensive experience in coal or oil-fired steam propulsion and diesel ships. Our experience also includes the construction of com- mercial ocean tankers/barges and chemical carriers, dump barges, derrick ships, passenger ships, stern trawlers, tug/barge units, and industrial products. BAY SHIPBUILDING CORP 1981 cent) ; Spain with 2.514 million dwt (4.8 percent) ; Romania with 1.712 million dwt (3.4 percent) ; and Poland with 1.509 million dwt (2.9 percent). Grade Heavy Fuel Oils." The sub- ject matter is applicable to heavy fuels used in marine and power generating diesel engines. Illustrated with charts and flow diagrams, the guidelines are con- cerned with Alfa-Laval's recom- mendations for the pretreatment and cleaning of residual and dis- tillate components from heavy fuel oil. Subjects such as dimen- sioning separators, mode of op- eration, pump arrangements, sep- aration temperature control, pre- treatment and cleaning systems, improving existing systems, and operation are treated in a com- prehensive yet easy to read man- ner. Protocol to the 1974 Interna- tional Convention for the Safety of Life at Sea (SOLAS). Copies of these instructions also have been given to owners of all ves- sels in ABS classification. Safety Equipment Surveys spec- ified in SOLAS '74, as well as other items usually reserved to port state inspections. POL) and its 1978 Protocol when that convention comes into force.